Travel-loving teacher currently learning to live in Madrid, Spain. A keen runner, an amateur baker and a bit of a bookworm, with an ever growing list of places that I need to visit! Why Costa Rica? For me, it was a combination of things: I hadn’t travelled in in this part of the world before and had heard from several sources that Costa Rica was Central America for beginners. Along with that, my Spanish was woeful and this lovely country boasts some brilliant, reasonably priced language schools, with immersion programmes where you can stay with a local family and attend daily classes. These were the official reasons. However, even though I was not planning to visit the traditional wildlife spotting areas, the potential chance to see some interesting creatures in their natural habitats was also very tempting. Top of my list? A sloth sighting – that creature so synonymous with Costa Rica that a handsome little fella was on the front of my guidebook. And so, I found myself in the home of Elbita and Alvaro in the lovely college town of Heredia for two weeks. Heredia is a suburb of San Jose. Despite being just a few kilometres away from the capital, it seemed much more calm, scenic and friendly. 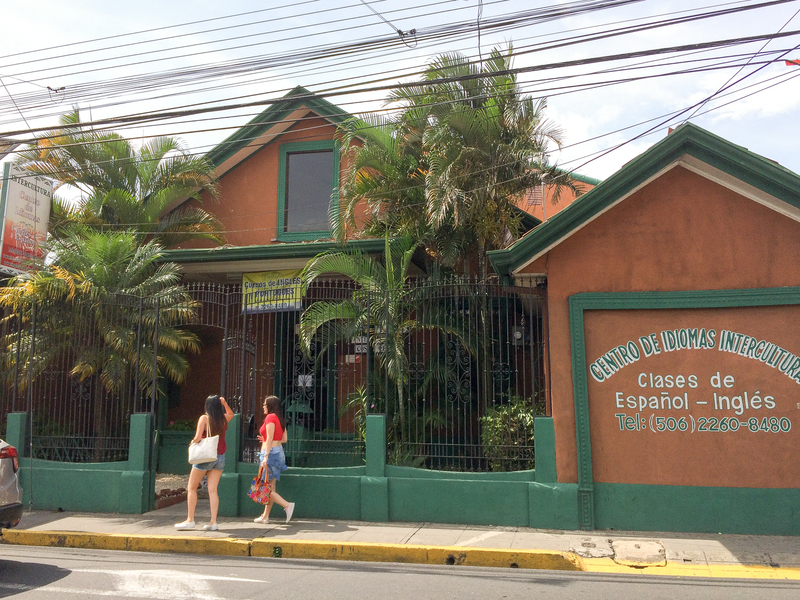 My homestay was a ten-minute walk from Intercultura, the language school where I was attending daily classes in an attempt to grasp at least some basic Spanish. With the words of my A level French teacher echoing in my head (“Bethan’s not a natural linguist…”) I arrived at what turned out to be the friendliest school imaginable. Cheerful reception staff greeted you each day, the classrooms opened onto a leafy courtyard with places to relax, or study, or chat, and the teachers were committed, lovely people with seemingly endless patience. 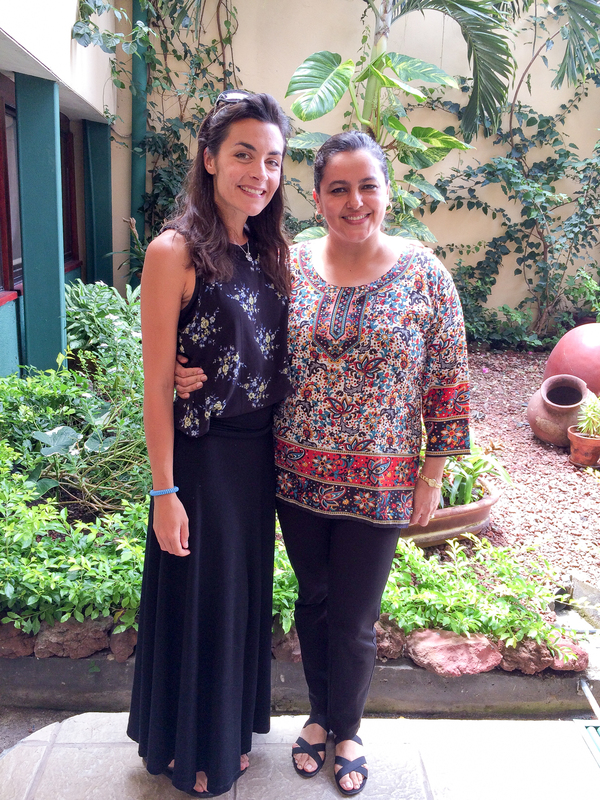 I felt lucky to end up with the same teacher, Ileana, for all my classes. She was a superstar. Classes ran for four hours each morning and then the rest of the day was free for exploring. Located in the central valley of Costa Rica, Heredia is the perfect place from which to visit the many coffee plantations. One afternoon after class, a few of us visited the Doka estate. 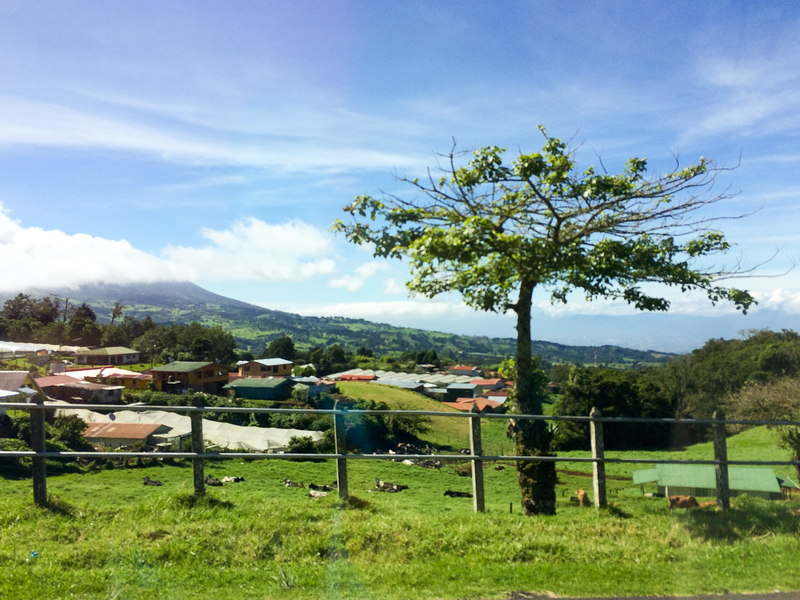 Driving to the estate along winding roads was a scenic treat, with vistas across the valley to San Jose, and roadside stalls selling fruit and local produce. The coffee estate was beautiful in its own right, and then to see how the beans are picked, dried, roasted and made into your everyday cup of coffee was fascinating, and far too lengthy a process to go into here. Most of the coffee gets exported from Costa Rica, especially the good stuff, and we were told that the everyday coffee from the supermarkets in Heredia wasn’t as good as the fair-trade kind we could get in our home countries. My daily morning coffee with Elbita and Alvaro confirmed this. However, the fresh, free samples given out at the end of the tour were amazing and we flew around the rest of the estate in a caffeine-fuelled haze. And finally, I was starting to see some beasts. 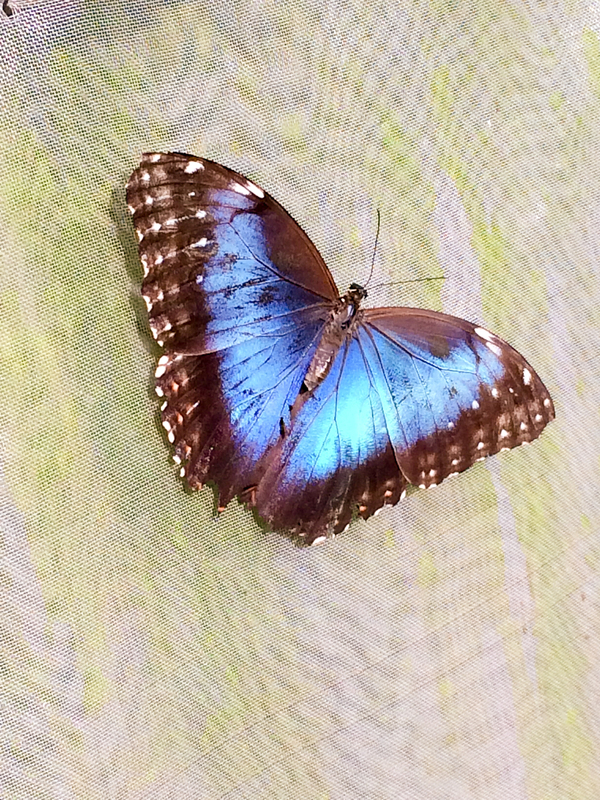 In the mariposario, I managed to control my fearful panic of ‘large things that flap too close to your face’ to admire some of the most beautiful (and huge) butterflies I’d ever seen. Sitting quietly by some of the tropical plants in the garden, we were then rewarded with a little show by the hummingbirds, hovering in and out of the gigantic flowers. So far, so good: two winged beasts. However, I was still keen to see something bigger, furrier, and sloth-shaped. Luckily a weekend away to Montezuma was planned. I set off with some other students from the school, under the watchful eye of Guillermo, our tour guide/friend/driver/amorous suitor (and that’s a story for another time). 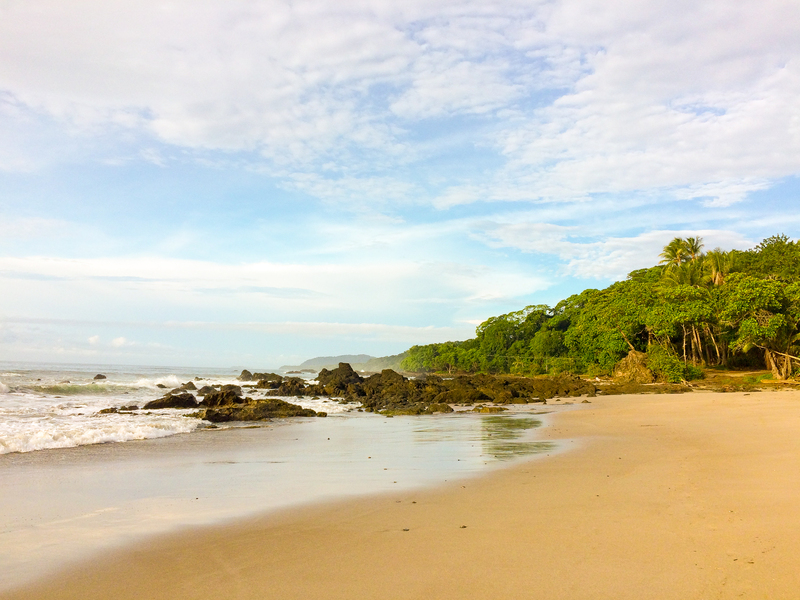 Montezuma is a super-relaxed beach town on the pacific coast of Costa Rica. Nicknamed Monte-fuma (for obvious reasons) and basically just a strip of tourist shops and laid-back restaurants, it was a total change from the towns in the central valley. 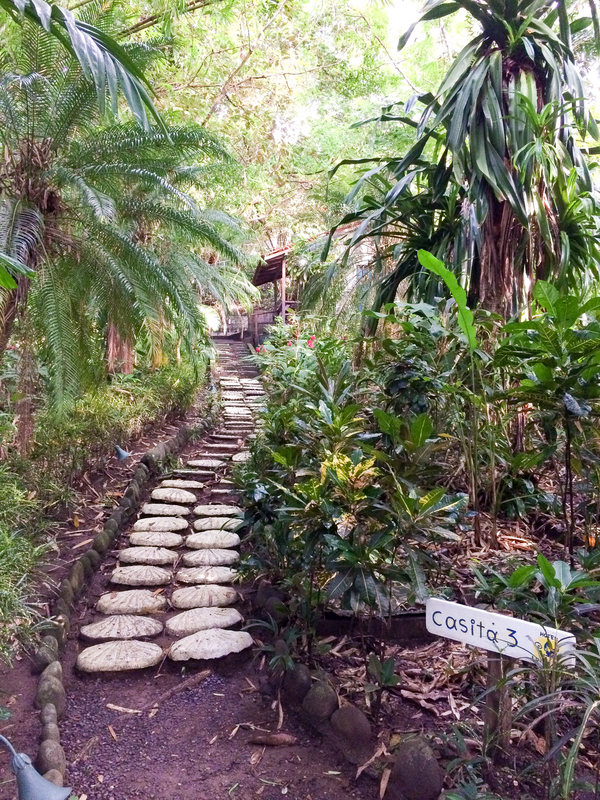 We arrived at our ‘casita’, which was nestled in the jungle, about 200 metres from a beautiful, pristine beach. I quickly realised that this was going to be a perfect spot to see all sorts of creatures. Indeed, many of these creatures seemed keen to welcome us, by creeping into my bed (small lizard), scuttling about in the shower (little crab), having a rummage through the bins outside (family of howler monkeys) or just by relaxing by the front door, ready to nip inside and cause terror and manic screaming (I’m talking about you: large, unidentifiable insect with a black shell and the look of Satan in your eyes). Luckily, after a few drinks and Guillermo’s reassurances that Beelzebub the Super Bug was keeping the other, more ‘bitey’ insects away, I started to relax into the jungle lifestyle. That mozzie net was thoroughly tucked in though, believe me. We awoke the next day to the nightmarish sound of howler monkeys. The sound they make is somewhere between a gasp and a roar, and is hard to associate with the nimble monkeys we glimpsed through the leaves. On the way to breakfast, we caught a glimpse of an animal we had not seen before, but which had scared me to death the night before by galloping across the path in the pitch darkness. Again, scampering through the trees, was something that looked like a cross between a rabbit, a rat and a pig. Sending this very scientific description back my dad in the UK (unexpectedly, Costa Rican wifi was amazing) he soon figured out that these little guys were probably agoutis: forest dwelling rodents. Thanks Dad. The creature count was increasing all the time. It was whilst I was on this amazing wifi, having a chat to the folks at home, that the lizard sculpture by the pool started blinking. I had been practically sharing my sun lounger with a foot-long reptile. At first I thought he was an iguana but further googling suggests he was probably a ctenosaur. I am rather pleased with the Jurassic Park-iness of this name. He had dark green shimmering skin, and his face was raised to the sun in a manner which can only be described as regal. He was quite beautiful. 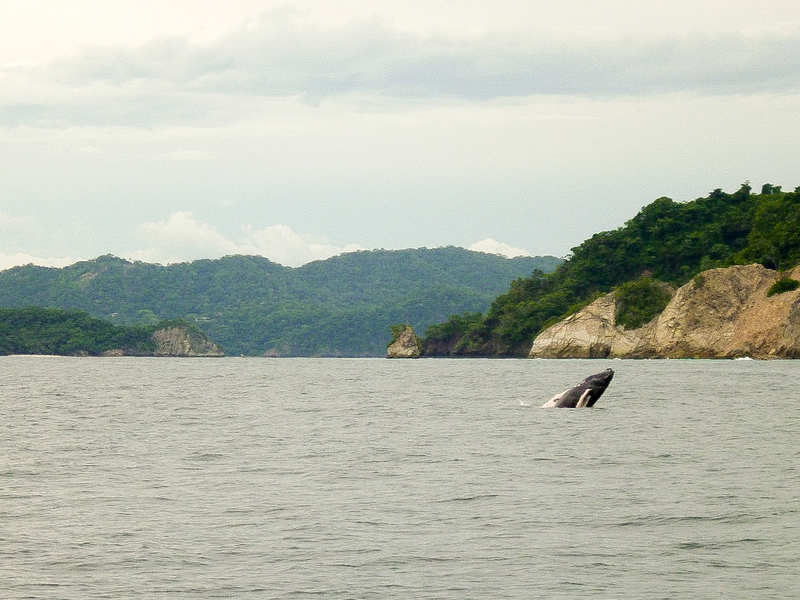 However, possibly the most stunning wildlife sighting came later that day, on the boat on the way to Isla Tortuga. Someone spotted a huge, dark shape rising up out of the water and we quickly realised that we had been joined by a humpback whale, swimming along in the calm, warm water. Humpbacks use these waters to give birth to their young, and there were gasps on the boat as we realised that the giant whale leaping out of the water was only the baby. Mum was still under the surface. When she came up for air, her sheer size and power was incredible. She was magnificent, and seemed to move at a prehistoric pace. This was my second humpback sighting – the other was in Canada a couple of years ago – and both sightings have been moving in a way that is difficult to describe. To see a mother with her calf seemed like an extra privilege. Such a privilege in fact, a pod of dolphins seen in the distance was met with low key interest. More interesting, in a fleeting and slightly voyeuristic way, was noticing a giant sea turtle from the deck of the ferry back to the mainland. It was only when a couple of locals pointed out that it was actually two sea turtles, literally making the beast with two backs, that we realised why the turtle seemed to be swimming so strangely. His mind was clearly elsewhere. My final day in Costa Rica consisted of a trip to Volcán Poás, an active volcano at 2, 708 metres with a mile-wide crater. At the bottom of the crater is one most acidic lakes in the world. It’s so acidic in fact, that it can’t support any aquatic life. Signs around the site advised tourists not to stay and admire the view for more than twenty minutes, as the gases being emitted could cause lung and eye irritation. Helpful signage along the route towards the viewpoint outlined the escape route off the volcano, should there be an eruption, and pointed out that ‘if you can’t breathe, return to the visitor centre’. Potential threats to life aside, this was a lovely place to spend my last day. It was only with a twinge of sadness at not seeing my sloth that I headed home. People often tell you that the love of your life will arrive when you least expect it. Turns out, the same is true of sloths. On the way home from the volcano, we encountered the Costa Rican version of a Canadian ‘bear-jam’… cars hastily parked by the side of the road, a horde of people staring eagerly into the undergrowth, cameras being waved around. 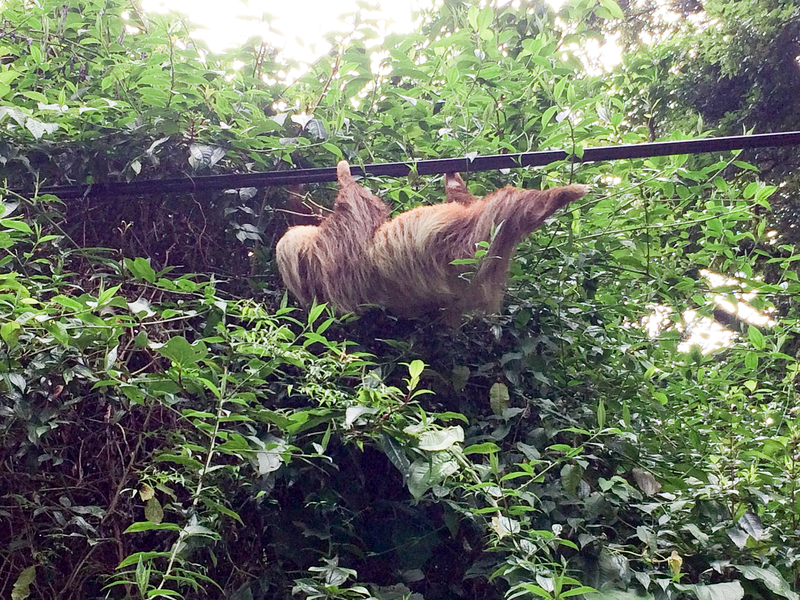 And there, hanging upside down from… an electrical cable actually, but let’s just say it was a branch… was my sloth. And I might be biased, but this was no ordinary sloth. I suspect he had been media trained. He – or maybe she: they are very hairy and identifying features are not easy to spot – was making his slow way along the cable, pausing occasionally to look down beatifically at the assembled crowd, or to strike a pose. The one-armed hang and the backward-glance-over-the-shoulder were particularly arresting. His characteristically ponderous movement down the cable meant that I got the quality sloth time I had wanted since I arrived here, and also, I nearly missed the bus back. And so, it was with a happy heart, some new friends, slightly less rubbish Spanish, loads of wonky pictures of animals and a souvenir sloth fridge magnet that I left Costa Rica, hoping to return one day. My sister was in Costa Rica recently and loved it. I would love to get there someday. I love Costa Rica one of my favorite places to travel. Love these pics, makes me miss it!! I have always wanted to go to Costa Rica but I had no idea that it was so synonymous with ‘sloths’. It is great that you met so many fantastic creatures, I would love to spot a humpback whale, I can imagine it is quite rare to see them. Wow! I love the sloth! That would be so cool to see in person!! We have talked about visiting Costa Rica and enjoying the fabulous lush nature and the animals but it hasn’t happened yet. One day, we hope! We travel with the kids and they would just love seeing these animals as well! That was one awesome experience! I mean, you’ve really maximized your stay in Costa Rica and got your wish granted at the same time. I love all the places you featured in this post, although I was not so excited about that gargantuan sized lizard. The sloth is a beautiful animal and you were lucky to see it in its natural habitat! Love the way the whole story built up to the sloth! Who would’ve thought that it would’ve been the highlight! Looks like it was a great trip! I thought I was going to get to the end of your story without you seeing a sloth! Thankfully there was one hanging on the wire for you all. I love that picture and also the picture of everyone photographing him! The location of your Spanish school looked perfect, much better than a downtown location. While my husband and I have never been .. we have good friends who own a house in Costa Rica. I’m thinking sometime we need to take them up on their offer for us to tag along .. it seems so beautiful. Because we’re such animal lovers .. I’d seek out the sloths and the butterflies. The funny reptile would be admired from afar! Costa Rica looks so gorgeous! The butterfly looks amazing and so vivid. I would love to visit here one day. I have never been to Costa Rica before. It’s amazing how close to nature you are and the beach is just so lovely. I’d love to see that volcano up close as well. It sounds like it’s definitely worth going to especially if you love the outdoors! I’ve never been to Costa rica, but I would love to visit and see it someday! I liked how you wrote this, makes me feel like I am part of your trip. Hehe! One more thing, I am afraid of sloths!! Haha but I would definitely love to see one in person in my lifetime! I like the fact that you tried to learn a bit of the language while you were over there. You actually made an effort to understand Costa Rica’s culture through its language. I think it’s a good precedent for many other travelers to the country. How much Spanish did you manage to learn? Wow! This is very awesome. Truly amazing. I want to get there someday to experience that kind of enjoyment. Super love it! I let out a little inward cheer when I got to the end and you revealed you did get to see a sloth after all! I mean, was that fate or what?! I’m so jealous of that! I had a very similar experience to you and the agouti except I was in the Peruvian Amazon and it was a capybara. Those things are HUGE! And apparently quite rare to see in the wild. Of course it was pitch dark at about 10pm and I was kind of lost when one ran out right in front of me. I haven’t screamed louder than I did that day! Have never been in Costa Rica but the place surely says something. The beach and the nature is a lovely sight to see. Here in my place, we are near volcano but wasn’t able to pay a visit. Your post makes me wanna go on vacation and appreciate the nature around me. This was a really cool adventure. I love your photos of nature and wildlife. I want to join an eco tour here. When I think of Costa Rica, I imagine a country teeming in history, culture and colors. And partly I was right. Your photos look so interesting and it piqued my curiosity about this beautiful country even more! That is a beautiful account of your time in Costa Rica. I loved your tale and the photographs except the reptile one but thats not your fault. I dont like them. The volcano looks amazing, I have never seen one. And tts funny how you finally got to see the sloth! I never traveled outside the country before. I would love the nature and hiking around the area and the FOOD! Ugh I would love to try the different meals they have to offer. your pictures look amazing. I would love to visit there one day. Amazing photos! I haven’t been to Costa Rica but the beach looks so inviting. I’m adding this to my bucket list. I want to see a real life sloth in action. Love your photos and stories about al the critters you met in your trip: the cheeky lizard, the forest-dwelling rodents (eek!!! ), the sly lizard, and of course, the sloth! These characters made your stories more colorful and interesting! I am curious about this Guillermo guy though. Hehe. Sounds like you had quite an amazing adventure! You went to so many lovely places. Montezuma does look so relaxing, and your casita is so charming! And you look great! This looks like a perfect getaway! I like that you can have a relaxing time although you mentioned about the monkeys. That would be okay. 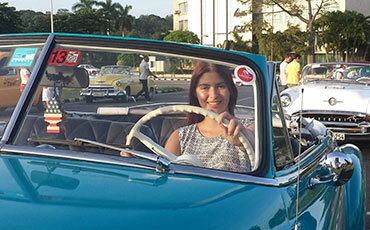 It is part of immersing oneself to the local community. I love your photos! I’ve never been to Costa Rica before. I’d be excited about the sloth too! I would love to go to costa rica sounds like a wondeful place! The beaches look fantastic and i could definatly see myself relaxing on one of them! 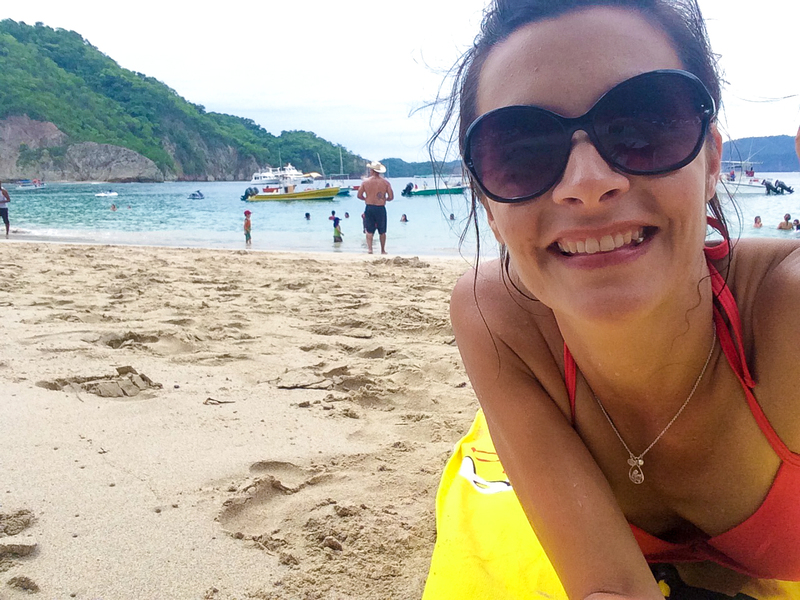 How wonderful that you took the effort in learning Spanish while in Costa Rica on your travels. It sounds like it was a great experience. Staying with locals and really immersing yourself in the culture is an excellent way to travel. I would definitely be squeamish at the sight of all those creepy crawlers. I am glad you saw your beloved sloth though! Such an interesting animal. Thanks for sharing. You take some stunning images!! This sounds like an amazing trip to take for sure. I’d love to be surrounded by so many animals. I’m a major animal lover with the exception of ants. What an amazing experience! I’m not sure I would have taken the time to learn a bit of the Spanish language, but I’m sure it was helpful. Sometimes it’s the little things that make the biggest difference. I was just looking at a travel guide about Costa Rica yesterday at the bookstore. It looks like such a beautiful place to visit! When mom was in the military, she was able to go TDY in Costa Rica and has wanted to go back ever since! Looking at your pictures I would love to go there myself! What beauty and a rich culture! I like that after you put your four hours in, you had the rest of the day to explore. I love learning about new areas via travel! That place in Costa Rica is similar to my hometown. There are a lot of greens, nature and beach to enjoy, but we don’t have sloth in our place. It’s nice to see extaordinary creatures during travel. The title is so perfect for your post…and what an interesting writing style you have! Costa Rica seems to have rewarded you with everything your heart desired…and more. Havent been to Costa Rica. You gave me an.idea of what to expect once there. I find the sloths too cute. Perhaps I have seen them only on Ice Age the movie. Those sloths are really hairy. I wouldn’t mind seeing one they look so cute. I would love to visit Costa-Rica looks beautiful! Looks a beautiful place to visit with my family and Looks like I want to go there on Vacation. Love all your pictures. 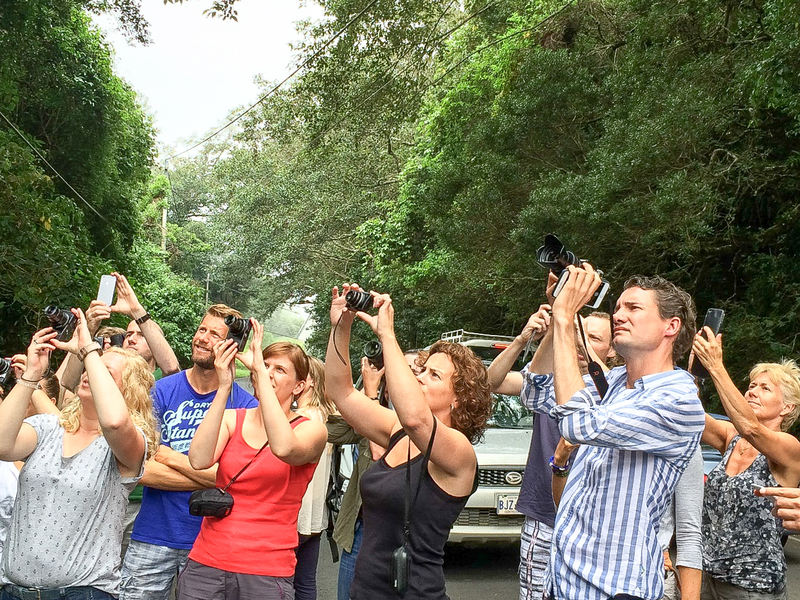 The sloth was the life of the party and the highlight of your awesome story for Costa Rica! Definitely enjoyed it. Would love to see a sloth too when we will be in Costa Rica for vacation. I am reminded of waiting to get a glimpse of Orangutan once. He or she comes swinging and the cameras go clicking with out flash. Cost Rica seems to be like a satisfying experience every way. I truly learned a lot of good things about Costa Rica. I didn’t know that they have a wide coverage of coffee plantation. I haven’t heard so much about this country and your blog post just tells so much about wonderful things. If I had a long drive while enjoying the scenic view along the road, it would be great. Thank you so much for sharing your travel experience with us. That sounds like a great place to study Spanish! I would maybe be interested to do that because my Spanish is so bad. And I’m glad you finally got to see a sloth. I would love to see one up close and personal! I would be excited as well to see a sloth in its natural environment, as far as I remember I’ve never seen one. Costa Rica must be a very beautiful country to visit, both for naturalistic and cultural reasons. Reading a bit about the country, it seems a sort of paradise, with high alphabetization, high-quality medical assistance and it’s also a sustainable country! I was sold when I got to know about the coffee plantation. Haha. I have read so much about this place and I knew that someday I have to visit this place. Glad to find out some more information. Costa Rica is definitely way up there on my bucket list! There are so many things that I would like to see and do there, but the main thing, is to go to the Land of Dogs! The humpback whale is so cool!!! I had no idea you could even find them in Costa Rica. Plus, the sloth looks pretty cute too. I’ve been considering heading down for a Costa Rican visit for a while, and your article is definitely pushing me even more, it looks like an amazing place to check out! Looks that you had a great experience there. I love to go there and see the amazing view in live. Costa Rica totally seems like my kinda jam! Laidback, reasonable and super fun with plenty of sun and sand! Your stay in Costa Rica seems AMAZING! And i’m so glad you could finally see your sloths, I was almost feeling your deception when you wrote you didn’t see them. 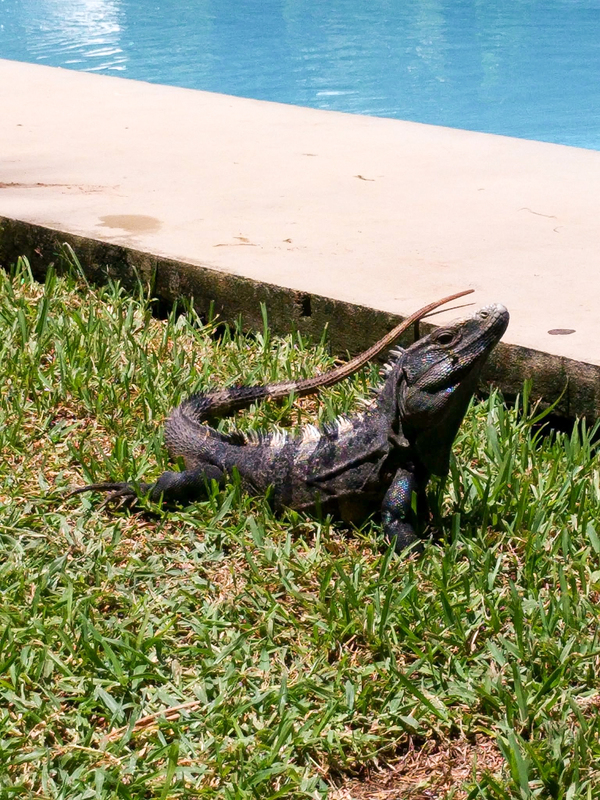 However I would have been so scared seeing lizards in my bed or around the pool (yeah,… it’s because I’m afraid of lizards. I know weird right?). I would have loved to see the volcano as well! What a beautiful place. The volcano looks stunning. I would love to visit an active volcano. Love your sloth story. 😉 The beach looks stunning. what a great writeup! I totally agree with you! Costa rica is the best place for adventure! and looks like you made the most out of it ! Cheers! We definitely want to go to Costa Rica as we’ve recently heard nothing but great things. I like that you called it Central America for beginners but that is kind of the impression we got from what we’ve heard. I guess we’ve heard that it is safe and friendly to foreigners. It looks beautiful and like a good opportunity to see wildlife you can’t see back home in Canada. Costa Rica seems like the perfect relaxing getaway. I want to visit here soon. The beach, the stay, the beautiful winding roads, everything about the place has a charm that attracts me. With volcanoes to hike, legendary surf, miles of beaches, and endless wildlife spotting, Costa Rica rewards repeat visits. I seek sun, nature or adventure, but there’s much to discover in this paradise of COSTA RICA. The location of your school and home in the jungle is really cool. Your reptilian friend is a real poser and it looks huge. I loved all your pictures especially that of a sloth and they are pushing me to plan a holiday soon to Costa Rica. Costa Rica sounds interesting, we would love to visit the coffee plantations and watch how the beans are processed. The experience at casita sounds fun with so many creature encounters. The place looks great too for a laid back experience. 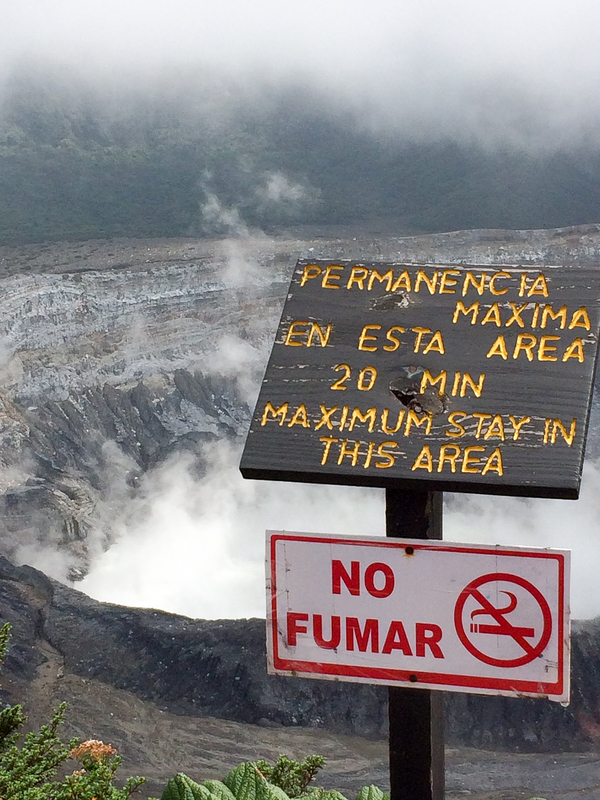 And while in Costa Rica we would definitely not miss on the active volcano Volcan Poas. Costa Rica looks like a beautiful place to visit. There is so much natural beauty there from the vegetation and the animals. That beach looks amazing and the colours on the butterfly is so pretty. Costa Rica is an outstanding travel destination! I would love to visit it!